Schloss Eggenberg or Eggenberg Palace is a beautiful historic attraction located in the outskirts of Graz, Austria’s second-largest city. The 17th century palace is the most important Baroque palace complex in the region of Styria and in 2010, Schloss Eggenberg was listed as a UNESCO World Heritage Site (an addition to the listing of Graz’s historic centre), a recognition of its significance in Austria’s rich cultural history. 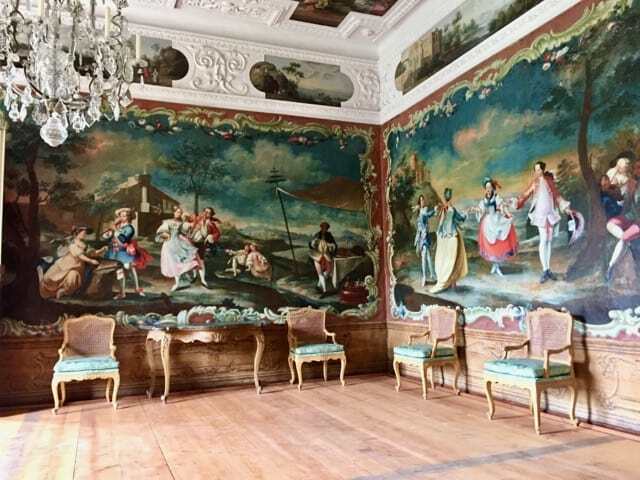 Though relatively smaller (and less well-known) than its palatial cousins in Vienna, Schloss Eggenberg is no less impressive, with an intriguing astronomical design, 24 lavish state rooms and over 500 ceiling paintings! The palace was built in the 17th century by the Italian architect and artist Pietro de Pomis as the residence of the Imperial Governor Hans Ulrich von Eggenberg. 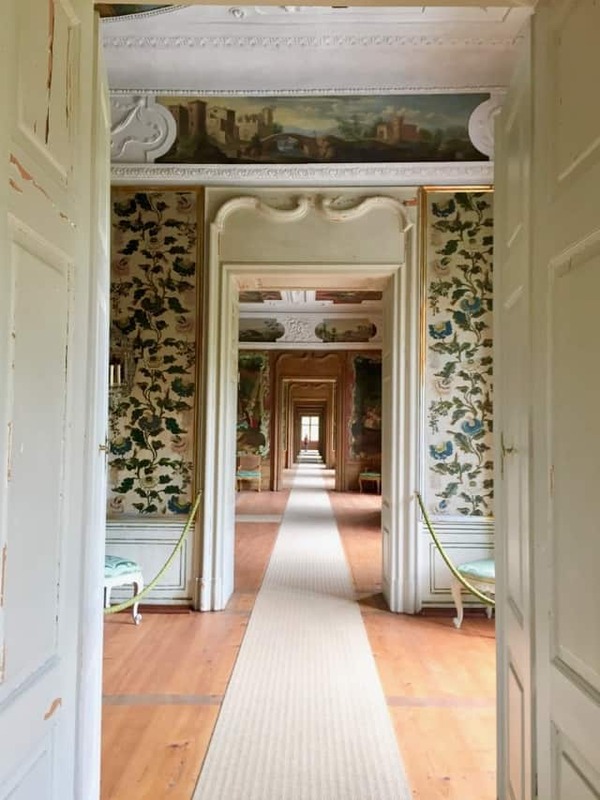 The grounds were previously the residence of von Eggenberg’s great-grandfather, Balthasar Eggenberg, who was the financier to the Holy Roman Emperor in the 15th century. In 1625, construction of the palace began and was designed as a statement to illustrate Hans Ulrich’s powerful position. 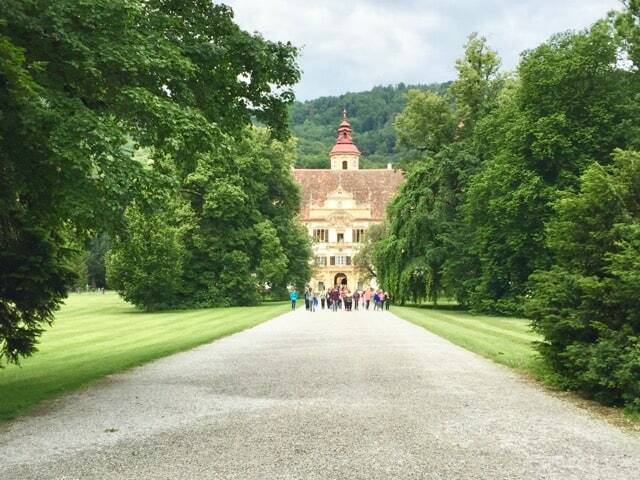 Schloss Eggenberg is easily reached from Graz’s city centre by tram (line 1; a 15-minute ride). Visitors entering the palace grounds will first see the expansive gardens which surround the palace. It’s a lovely walk from the entrance gate to the palace, past extensive lawns and towering trees. The path past the expansive gardens to Eggenberg Palace. Inside the palace, visitors can register at the gift shop for a tour. The tour lasts about an hour and takes visitors past the most beautiful state rooms including the stunning Planetary Room. One of the state rooms. As I toured Schloss Eggenberg’s state rooms and listened to the guide’s commentary, I became intrigued by the palace’s unique design. Hans Ulrich was fascinated by astronomy and astrology, and ordered the architect to integrate astronomical symbols into the design of the palace. The palace has 4 sides, representing the four seasons of the year, 365 windows (representing the days of the year) and 24 state rooms (hours of the day) with a total of 52 windows (weeks of the year). As the tour progressed, more astronomical and astrological details were revealed. The hallway that connects the state rooms. Impressive paintings in the state rooms. Another thing that intrigued me was the Oriental room. When I first looked at the paintings on the wall panels, I chuckled to myself. The guide described how the artist used his imagination to create scenes from the Orient (which he’d never visited) – some of the scenes reminded me of the fantastical genre! The guide then turned to several wall panels and began to explain the mystery of these specific panels. No one knows where they came from but scholars discovered at some point that these panels present a rare depiction of Osaka, Japan, in the early-17th century, before the city was destroyed by a siege in 1615. 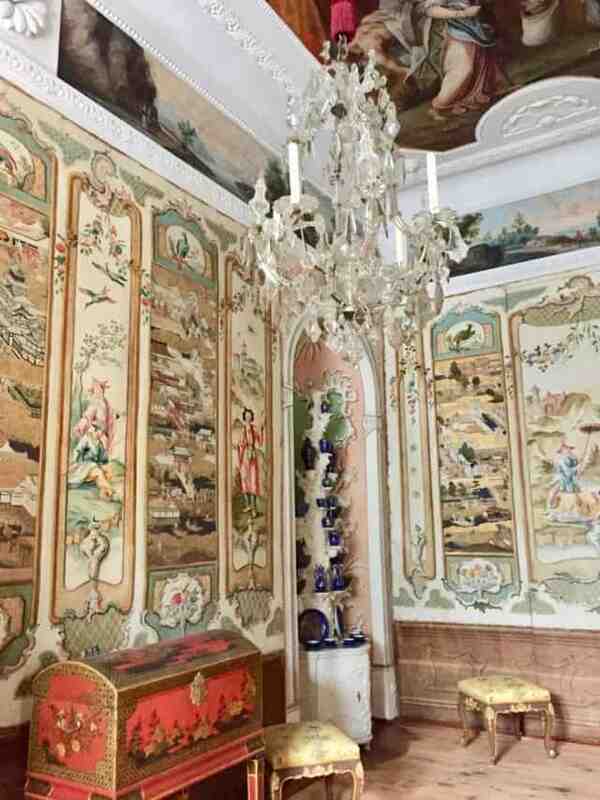 It was quite amazing to see these panels here, in a palace in Graz! Fantastical scenes of the Orient mixed with scenes of Ancient Osaka. 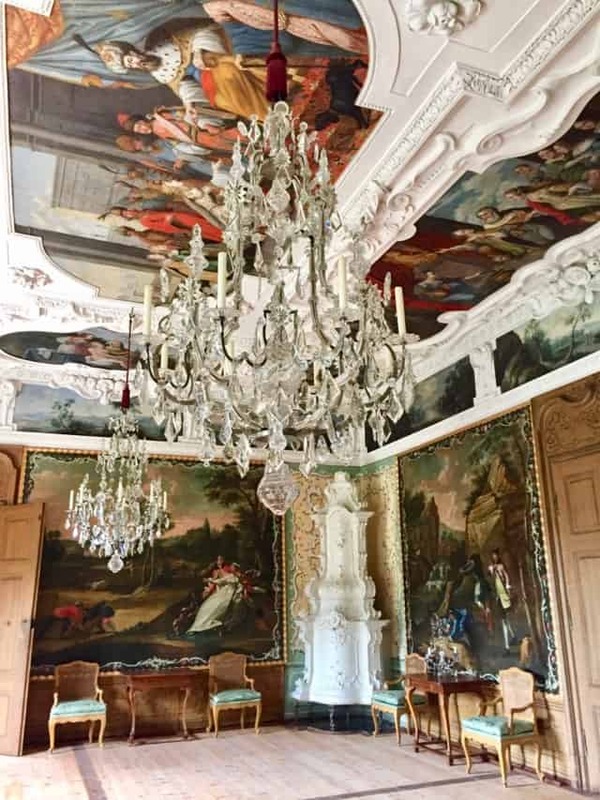 The Planetary Room is undoubtedly the highlight of the tour of Schloss Eggenberg. Again, astronomical and astrological elements are integrated in the design of this main hall. The paintings and chandeliers add an unmistakable grandeur to the hall. After touring the palace, I recommend a stroll around the beautiful gardens. Through the centuries, the gardens were first modelled after typical Italian designs, then changed to French (18th century) and later English (19th century). Look out for the peacocks and visit the Planetary Garden in the palace’s northern corner. One of the peacocks at Eggenberg Palace. 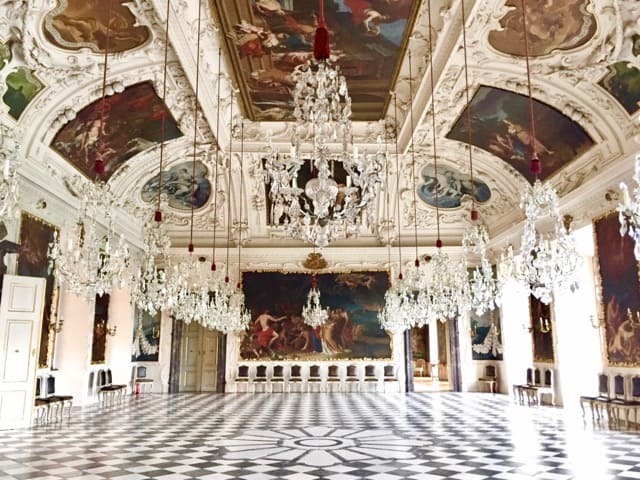 If you’re visiting Graz, plan a few hours to visit this impressive palace. It’s definitely one of my recommended things to do in Graz. 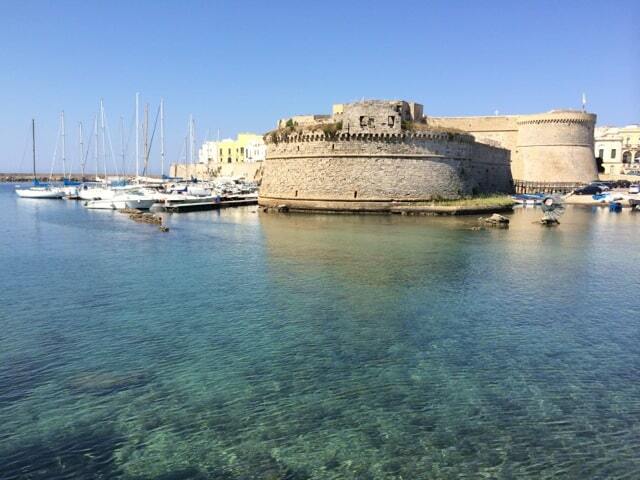 Looks like I’ll have another palace to visit while traveling through Europe … stunning!